Kelly Neuman is a full-time flyfishing guide who specializes in trophy trout. 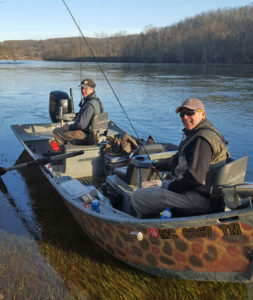 During winter months he fishes the White River in Arkansas and in summer months he can be found in Michigan’s classic trout streams, including the fabled Au Sable River. With 25 years of guiding experience and ten years on the White River, Kelly is your go-to guide for big browns. From beginning anglers to seasoned veterans, he can put you into fish. Eric Swies has guided on the White River for several years. Includes: 8+ hours on the water, lunch, drinks, use of equipment. Does not include fishing license. What to bring: Polarized sunglasses are a must. You can bring your own rod/reel or use ours. Waders are useful but we can also fish entirely from the boat if you don’t have them. Raingear and cold weather gear to match the weather forecast. Package Deals Available – Check them out. 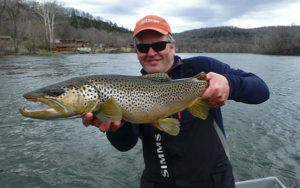 Lodging Available at White River Trout Lodge. Custom trips and packages available – just contact us and let us know what you want! Pay Deposit ($200) after confirming date availability with us.